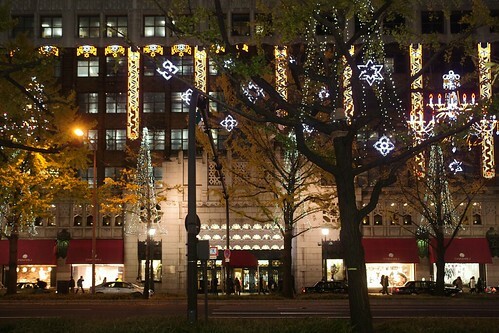 The Daimaru Shinsaibashi department store building in Namba, Osaka, is almost a century old. 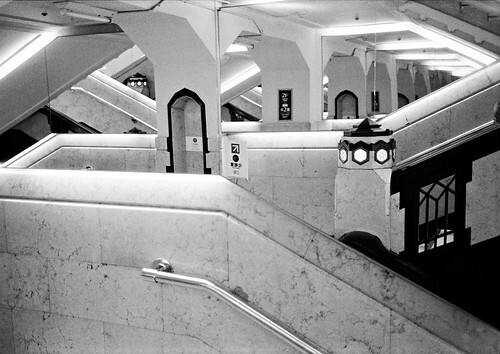 It's always felt a little old-world, a bit art-deco with stained glass and lots of stonework details. And now it's being torn down. Daimaru Shinsaibashi during the last Christmas light decoration this winter. Ritsuko is in the picture if you look really closely. It has been a landmark store in the area for longer than most people can remember. It was major news when the demolition was announced, and the final months the employees fought a losing battle against hordes of customers taking pictures of everything and anything related to the building. 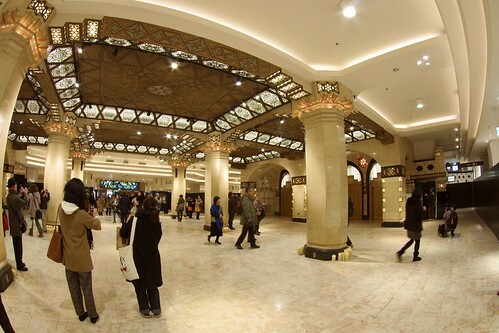 They recognized the great interest, so they had a one-time event late January where Daimaru card holders could enter the now-empty store and take pictures of the first floor area. It was a popular place to meet. The entrance was usually full of people waiting for somebody. 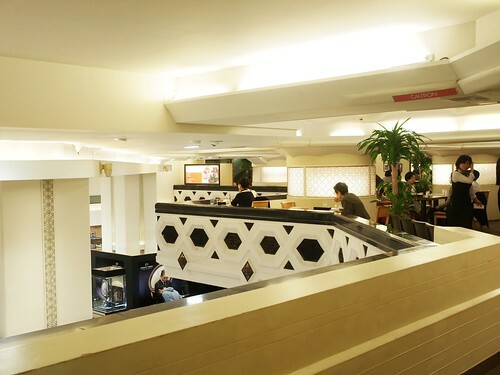 The mezzanine cafe. Low ceilings by today's standards. It's sad that the store disappears, of course, but I can understand why. The building is almost certainly not up to modern earthquake standards. And while the building is very beautiful, it's also very worn and really a bit too cramped to work well as a department store. A lot of that beautiful stonework is cracked, the stone floors are worn and uneven, and the all-important depachika — the grocery and delicatessen one floor down — is really quite small and with low ceilings by today's standards. 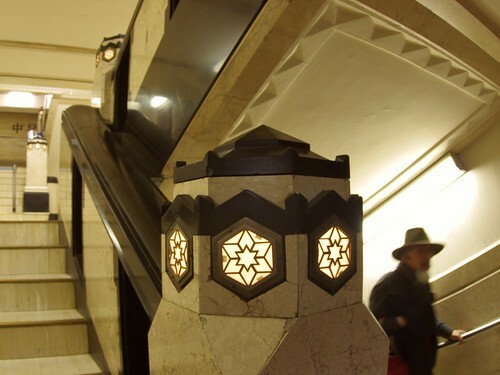 A stairwell stone railing post. 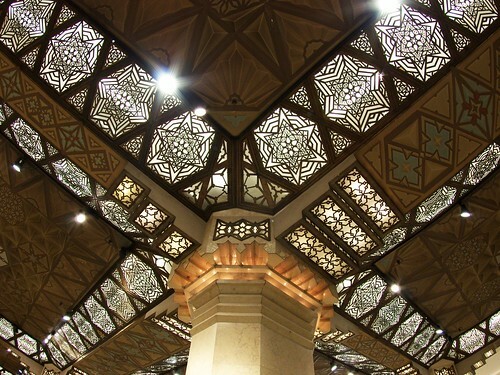 Beautiful design, but if you look closely, it's all quite worn, cracked and broken. You would have to outright replace a lot of the interior if you would try to renovate the building rather than rebuild. The new building will keep the current design of the façade, and it's said they'll also incorporate elements of the old interior. Hopefully they will be able to keep the charm of the old design in the new one. The main hall on the first floor. I was afraid it would feel sad or abandoned, but it wasn't like that at all. Lots of people were constantly coming by, talking, pointing and taking pictures. Celebrating the building rather than mourning it. A pillar support on the ceiling. All that inlaid stonework and stained glass really is amazing, and now that the room was empty you could finally appreciate all that detail. 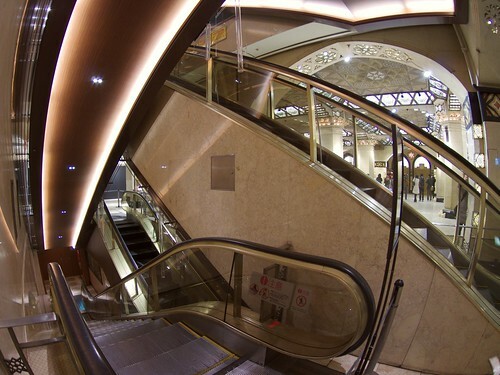 These escalators have run for the last time. 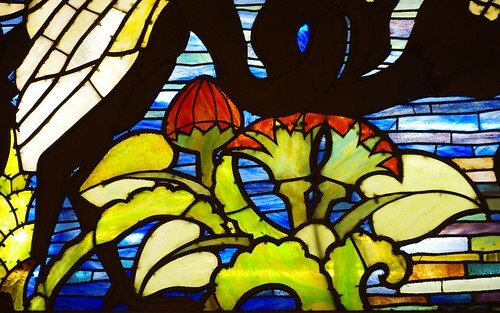 The stained-glass frieze above the entrance towards Midosuji. The store has been here for as long as I've lived in Osaka — and all her life for Ritsuko, of course. Now it's gone. That's a major change. But that's OK. There will be a new store there in a couple of years; bigger, and perhaps even more beautiful. Change is often a good thing. 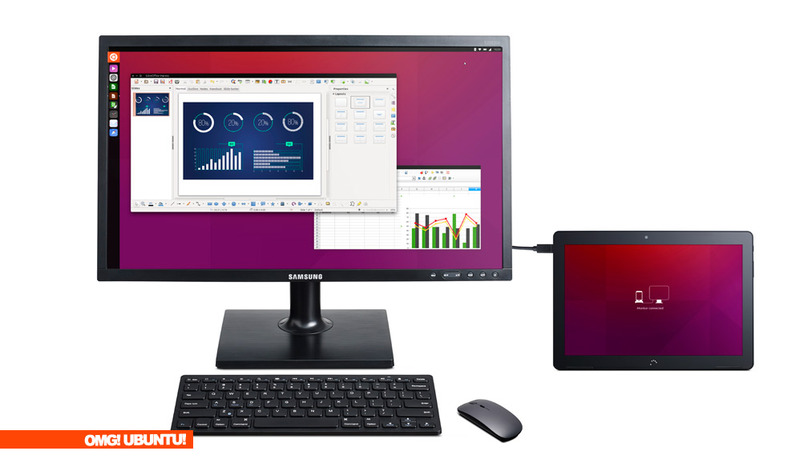 Ubuntu is finally launching a tablet for Ubuntu Touch and regular Linux use. I've waited for something like this for a long time, but especially now that I have a high-performance desktop at home. A light-weight tablet would be a perfect companion device. Do all heavy work - image editing, gaming and so on - on the desktop, and the tablet everything else away from home. 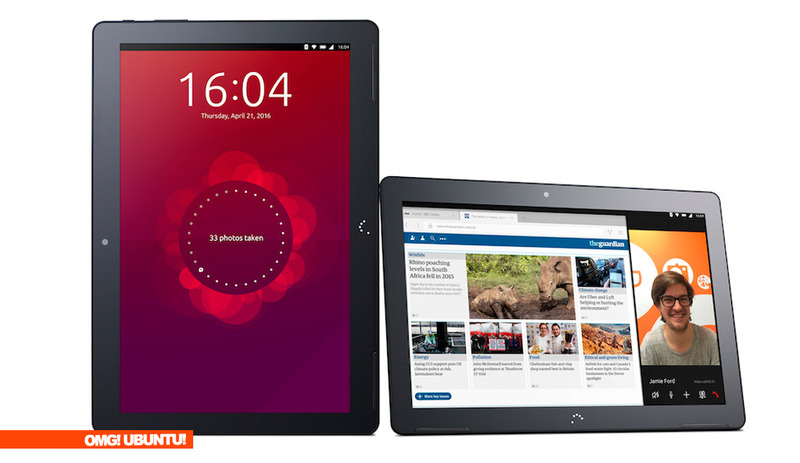 The Ubuntu Tablet as tablet. Why this and not an Android tablet? Ubuntu Touch is Ubuntu's mobile system, already available on a few phones in Europe. It's a pretty good, lightweight system. But connect a keyboard and perhaps a mouse, and the tablet becomes a full, unlimited Ubuntu desktop, with all the software and all the tools you would expect. It's a pretty compelling argument: I would never need to drag a laptop around any more. The lightweight tablet would be able to do it all. My Android tablet works fine for web surfing and stuff, but it's not a laptop replacement. But with this one I could do full presentations; run interactive tutorials with students directly from the tablet; work on programming projects; do all my writing, editing and publishing; perhaps even some lightweight image editing. I'd basically not need a laptop any longer. Unlike Android (or IOS), you don't have to rely on poky mobile replacements, but use all the actual, real apps directly: Write, calculate and present with Libre Office; surf the web with Firefox and Chrome; do graphics with Gimp and Inkscape; science all the data with Octave, R, Scipy and friends; get coding with Python, C/C++, Fortran, Ruby, or your favourite language; and use Vim or Emacs if you're Old Skool, or IntelliJ and Eclipse if you pine for a full IDE — or even the Arduino software for some on-the-road microcontroller development. The tablet with bluetooth keyboard and mouse, and an external monitor. Now you've got a full, regular Ubuntu desktop at your fingertips. The device is a 10" tablet from BQ, a Spanish maker, with a high-resolution screen, a decent ARM CPU, 2GB ram, and 16GB internal storage, with a slot for a 64GB micro-sd card. Overall it's good hardware, in a tablet that gets favourable reviews as an Android tablet. At first I wore my "laptop hat", so I was a bit sceptical: "Um? A bit low powered, isn't it?". 2GB RAM would be the low end for a laptop, and 16GB storage is not a lot of room. Even a full 64GB micro-sd card isn't comparable to a real laptop. But as I thought about it, I realized just how great a device this is. It is a thin, light-weight — lighter even than my beloved Sony Tablet Z! — tablet at a very good price. As a device, it's really quite capable; faster than my current tablet and several times more powerful than the newest Raspberry Pi 2 that people use for all kinds of things, including as an inexpensive desktop, server and even development machine. The Android version is €250 (€200-220 online), and the Ubuntu version will be about the same. That's less than half of a Sony or Samsung high-end tablet, or what a not-painfully-bad laptop would cost you. Most important, the price is within the "play money" limit for a lot of people. You can get one and try it out without having to make a big budget commitment. If it fits your work-flow, great! If not, then no harm done. At the very worst, you'll have a spare tablet around the house. One more thought: Microsoft has sort-of-similar convergence devices in their Surface tablets that are much more capable. But they really are a different kind of device; larger keyboard-less Intel-based laptops, with much higher weight, bulk and price. They are really competing with regular laptops, not tablets. Yes, you can apparently install Ubuntu on them if you want. But at that size and price, I would probably just get a regular laptop instead. Microsoft did have an ARM-based tablet once. It flopped hard. It's problem — apart from being rather heavy and expensive — was the lack of any software (and they even expressly disallowed users from loading software on it on their own). It wasn't compatible with classic Windows apps, so developers had to port their software, then publish it in a special "store." And nobody did. Lack of software is not the same problem for the Ubuntu tablet. After all, most Linux and Ubuntu software is open source, and is only a rebuild away from being available for ARM systems as well. You can — and people do — run a full Linux desktop on the (much less powerful) Raspberry Pi, and you can effortlessly do it on this tablet. This hardware is plenty capable of running all but the most demanding things. I wouldn't edit film scans on this - but then, I wouldn't do it on a laptop either any longer; that's why I got that big desktop after all. Analysing large amounts of simulation data is probably also out due to the limited storage, but I have computers for that at work. I'd really only miss some closed-source games that won't run on an ARM cpu. I've been slowly playing through my library of GOG adventures during business trips, and I wouldn't be able to do that on this one. Do I want one of these? Yes. Yes, I want one very much. At first the specs worried me, but after thinking a bit I realize this is a perfect first Ubuntu tablet, in price and performance. In the ordinary course of things I would probably press the "buy" button within hours of it going on sale. Unfortunately, I don't think I will be able to. One problem is the availability. It's an European tablet, and will be sold in Europe and US only. If I have to import one myself, the price will likely rise by a third, and go well beyond my "play money" level. But most importantly, I am leaving active research and will likely be unemployed by the end of March (a subject for another post). Spending even a smallish chunk of money on a new toy weeks before you lose your income would not be terribly prudent, to say the least. Once I do find new work I may well celebrate by getting one of these, but unless the Computer Fairy comes for a surprise visit I will have stand by and watch the launch by the sidelines.